The cat saw the sea through the window. It purred and looked lovingly at it. It wanted the water as it wanted love. It didn't know what waves were, but it got anxious. Reaching the shore was its biggest desire. It jumped down the window, crossed the street and arrived at the coveted place. An so their courtship began. Nobody has ever seen anything quite like it. It's not every day that you spot a cat taking a stroll at the beach. People walked by on the sidewalk, but none of them paid any attention to such an unexpected event: a cat in love with the sea. Water and feline animals don't mix, or so they say. A cat falling in love with the sea... Such a thought would never cross anyone's mind. Nobody turned to watch the cat trying to approach the restless liquid. But there it was, paying attention, waiting for the waves to get distracted and careless. Maybe it would get ready to pounce on it. It was testing the waters, even though it didn't understand it. The cat had met the unexpected: something that rocked gently and called its name. It was hard to resist, but the cat was very resisting―instead of being mesmerized by it, it wanted to mesmerize the waves. “I can jump too,” it said, jumping forward just to show off. They started dancing a weird dance: the cat not only wanted to surrender to the sea, but it wanted to make it surrender too. The sea did almost the same, but it was larger and more tempting. It was hard to tell which movement was the most powerful. One was flirty. The other was vast. One tried to win on its agility. The other, on its vastness. It was a dangerous duel. Both were attacking, both were showing off, both were tempting and skilled. Each had their own set of charming tools. “I can do it,” the sea whispered. “No, I can do it,” the cat insisted. Their dancing, their duel was full of beauty and frights. Men and women keep walking by without noticing it. They all looked so busy. In the meantime, while their kiss didn't come true, the tied dance match led to an unexpected question: Was the sea purring or was the cat surging? Only they could understand the meaning of their dialog. Coming between the animal and the aqueous vastness, the sun brought in the light and came up right in the middle of the two. “I don't know what your intentions are,” it interrupted. A little astonished, they both looked up. “It's none of your business,” the disrespectful cat answered. “We're trying to see who will win,” the sea explained. “It's time you two resolved this situation already,” the sun cleared it up. Down below, both of them were thinking it would have been better if the sun hadn't meddled with them, given them orders. But they needed to find a quick way out indeed. The sea retreated its waves. The sun got a little bored and hid behind a cloud. The cat looked at the sea through the window. The sea moaned and revolved the water at the beach. Even though they are apart, their courtship went on at a distance. “Yes, yes, feel free to continue,” said the understanding window through which they looked at each other. Cleber Pacheco has a Master's Degree in Brazilian Literature, emphasis on Philosophy. He writes novels, short stories, poetry and plays. 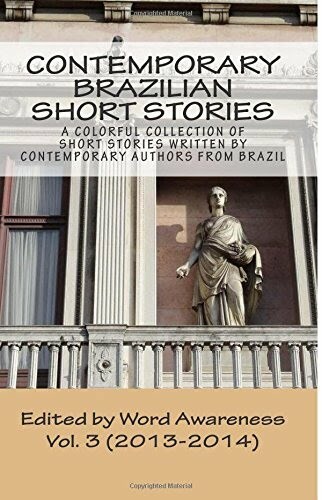 He has published fourteen books in Brazil and one in the United Kingdom. Cleber has also contributed some material to poetry collections published in Canada, United Kingdom and India. His play “Intimidades” [Intimacy] received two awards and his book of poems, entitled “Mysteries,” has recently finished first in a competition and will be published in the United States. To read more of his work, visit his blog Translittera.